doesn't happen? You Tube videos. World's end. .... and what if the rapture doesn't happen? When we originally wrote this essay, we felt that this was the most probable scenario. After all, all of the other predictions of the time of the rapture, the second coming of Jesus, the war of Armageddon, etc. that were to happen in our past have failed miserably. We condcluded that there is every likelihood that this prediction and all future prophecies will also fail. We were right. 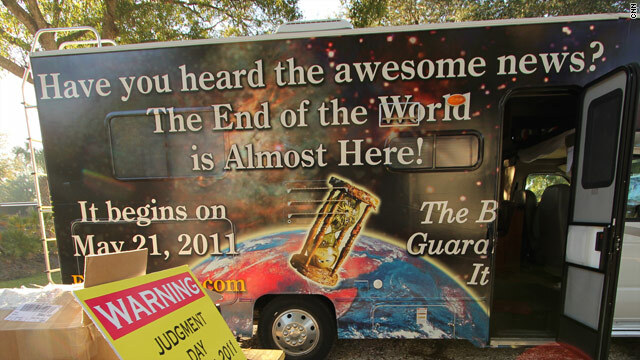 Some people who have invested their life savings in publicizing the rapture will be destitute. There will be a lot of dead pets whose owners had euthanized in order to escape the horrors of the tribulation that never happened. Hundreds of millions of people will have suffered needless anxiety. Harold Camping, Family Radio, and by extension all of conservative Protestantism will suffer various degrees of loss of credibility among the general population. The current high rate at which late teens and young adults are leaving evangelical Christianity will probably accelerate noticeably. Many of those who have invested personal effort and money in Camping's predictions will probably remain believers, and assume that a minor tweaking of his calculations will produce the correct date. Many people will switch their attention to the next prediction, the potential disaster on 2012-DEC-21. When that date passes uneventfully, they will start searching for still another date to pin their expectations on. A search of You Tube for may 21 judgment day found about 3,539 videos! One video, apparently posted by Family Radio, received almost 1.8 million views by 2011-MAY-16. Unfortunately, the posting of comments is disabled or we would have added one. He has published a book "Time Has an End: A biblical History of the World 11,013 BC � 2011 AD," Vantage Press, (2005). Read reviews or order this book safely from Amazon.com online book store. Alternately, you could wait until after 2011-OCT when the book will probably go on sale a lot cheaper in bookstores worldwide, just like Camping's two books about his 1994 end of the world prediction did.